As sweet as cinnamon: Christmas Surprises in the Mail! 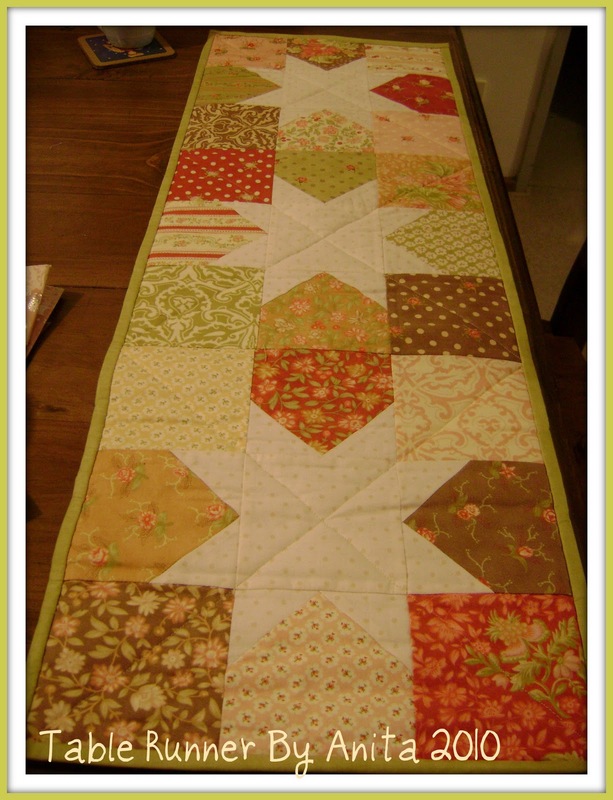 a gorgeous table runner in my Favorite Fig Tree fabrics. Its just so lovely... Love the stars. Also there was some other goodies. Cookie Cutters, decoration for my tree. Red Ric Rac..
Rudolph nose tags, keyring, chocolate candles. 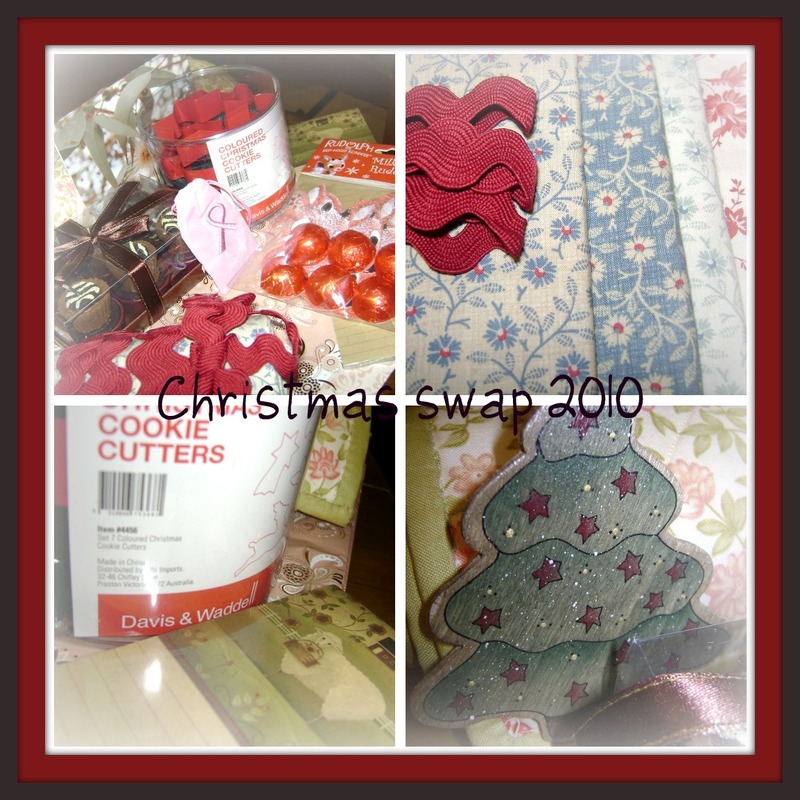 Thanks Anita for being my swap partner. 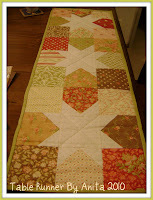 Yes Anita make a gorgeous table runner for you Dawn. I am sure there is someone who will love to use the cookie cutters. Just visiting from Holly Jolly Bingo. What a nice table runner! Hello! I am a Holly Jolly Blog Bingo player and I have been reading your blog for a while now. Have a nice day! Perfect table runner, I'm followint the holly jolly bingo, and have a nice time. Kiss. Loredana. Congrats! How lucky you are to get such a Lovely surprise! g-o-r-g-e-o-u-s!!!! Nice little pressie package, eh! MERRY CHRISTMAS!!! 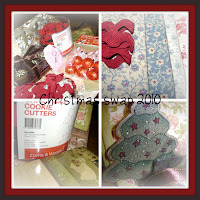 What a wonderful swap partner - such lovely gifts!!! I'm sure you'll put those to great use! What lovely surprises the mail brought you. Everything is lovely. I haven't visited in a long time. Life got in the way. I will do more visiting in the future. I look forward to the BOM. Have a Merry Christmas and a super great day. Glad you liked all the pressies Dawn!! YOu have really gotten some lovely gifts in the last two posts. I am sure it feels like Christmas at your home.